Esri Netherlands produces maps for the Dutch media to illustrate political, economic, technology, sports, and other stories. During the recent provincial elections in the Netherlands, BNR Nieuwsradio published maps on its website that showed which parties won the greatest percentage of votes in each municipality. Maps created with Esri technology also have been used to tell other data-driven stories, from the bird flu outbreak in the Netherlands to the Ebola virus crisis in Africa. Read the article. 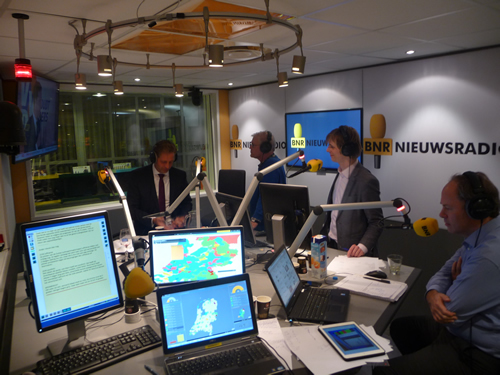 Using maps provided by Esri Netherlands, BNR Nieuwsradio staff could see where various parties were winning the provincial elections in the Netherlands. Yes, it can be done: You can embed a story map into another story map. But some Esri Story Map templates, such as Story Map Swipe and Spyglass, provide better frameworks than others for doing this. Read the tip. Executives from Walgreens, General Motors, and other companies will attend the Esri Business Summit, where they will talk about how they apply geography to improve customer service and make better decisions. Read the article. Geodesign Summit Europe is coming to Salzburg, Austria. It's an inspirational location for the event, a jewel of both medieval and modern design and architecture. Read the article. Register for the summit. PenBay Media and Esri partner GISi use the ArcGIS platform to help EPA scientists make more informed decisions about issues such as lead exposure and water contamination risks. Read the article. The White House Utility District in White House, Tennessee, uses the ArcGIS platform to better manage its sewer and water systems, saving water, time, and money. Watch the video. You've helped pick a party venue and scrolled through the big agenda. Now it's time to get serious and sign up for the Esri User Conference. Esri's Bern Szukalski talks about his first conference and why the work the Esri user community does inspires him every day. Watch the video. Register today. What types of technology do data scientists, such as Shawn Hanna of Retail Scientifics, use to help companies like Petco make better business decisions? Read the blog. Access 2015 Demographics, Tapestry, Traffic Counts, Spending, and Market Potential data and reports from the ArcGIS platform from home, a client's office, or in the field. Sign in to Esri Business Analyst Online and get started. 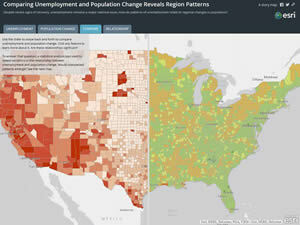 ArcGIS Content from Esri provides a complete package of demographic, lifestyle, and spending data; basemaps; imagery; and routing and geocoding services. How would a movie theater chain, for example, use ArcGIS Content? Read the article. Jay Theodore, the Esri server group's chief technical officer, previews topics of interest at the Esri User Conference, including expanding capabilities to perform spatio-temporal analytics on large volumes of real-time data. Read the blog. Esri's new Terrain Tools toolbox gives you capabilities to represent terrain in new and more artistic ways in ArcGIS. Read the blog. Download the tools in beta. The Esri Developer Summit Europe has been held in cities such as Madrid, Spain, and London, England. This November, geodevs are invited to three days of user presentations, tech sessions, and speed geeking n Berlin, Germany. Read more and register. See the current height and flow data for rivers in the United States using the new Live Stream Gauges Map available to ArcGIS Online users. Stream gauge data contributions are welcome. Read the article. Joseph Kerski and James Rattling Leaf created a Lakota Language story map. The map includes audio pronunciations of 12 words in Lakota, a language spoken by some members of the Sioux nation. Read the blog. View the story map. Esri offers US customers GeoCollector for ArcPad and GeoCollector for ArcGIS for Windows, two high-accuracy data collection solutions. Order today. Use these five maps to explore the damage caused by the magnitude 7.8 Nepal earthquake in April and subsequent relief efforts. Read the article and view the maps. O'Malley on "A Second American Revolution"
Presidential candidate Martin O'Malley, former governor of Maryland, will be the keynote speaker at the Esri User Conference in July. He's a longtime advocate of using GIS to make government efficient and transparent. Read the article.